Isn’t savvy such a fun word? There aren’t many words with double Vs. I recently ordered “More Fashion Savvy” from Amazon. It is a wonderful book, exactly what I was looking for. It seems my younger sewing students are drawn to fabrics that are tricky to sew. Since I tend to avoid such fabric choices knowing how hard they are to work with, I needed quick guide to refresh my memory so I can offer some suggestions. I inherited a 12 year old student with a half done polyester charmeuse top. This book has a couple of tips that should make finishing up her top easier. It won’t be perfect. 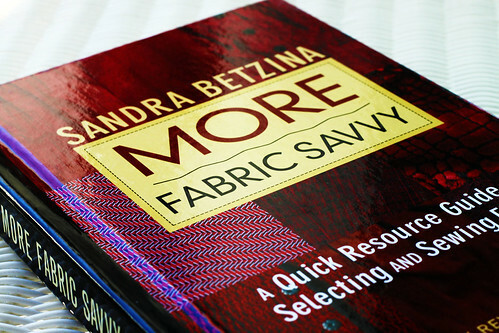 Sandra Betzina clearly states that polyester charmeuse is impossible to sew pucker-free. This entry was posted on Wednesday, September 16th, 2009 at 3:00 am and is filed under Sewing. Tagged: Book, Fabric, Sewing. You can feed this entry. You can leave a response, or trackback from your own site. When I was about 13, my mother sent me to a lady who taught me to sew. I took along with me a dress pattern with princess seams and plenty of Prince of Wales check fabric. Obviously, I had not got a clue as to how difficult that would be for matching the seams. My sewing teacher was so patient! I ended up with a wonderfully well made dress.